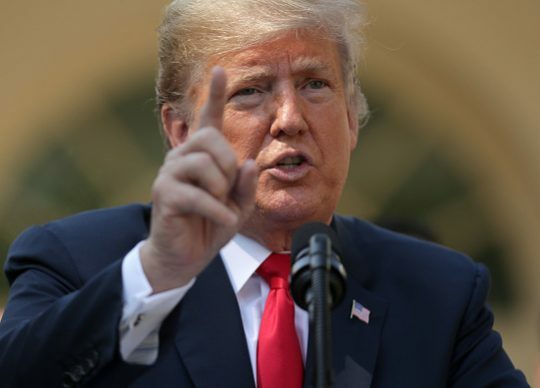 President Donald Trump sharply criticized a bill introduced in the Virginia state legislature which would allow abortion through the moment of birth. The president directed his remarks at Democratic governor Ralph Northam and the bill's sponsor Delegate Kathy Tran. On Tuesday, Tran was asked if, according to her bill, a woman would be able to have an abortion up to the moment before birth. "I thought it was terrible," Trump said of Tran’s remark in an interview with the Daily Caller. "Do you remember when I said Hillary Clinton was willing to rip the baby out of the womb? That’s what it is, that’s what they’re doing, it’s terrible." Earlier today, Northam said physicians should not have to treat babies who survive abortion until they have "had a discussion" with the mother about whether to provide treatment. Northam's comments came during a discussion of Tran's bill on WTOP. "I’m surprised that he did that, I’ve met him a number of times," Trump said. The president added that he had not yet heard the governor's remarks. Trump also said he thought Tran's and Northam's comments could help the pro-life movement. "This is going to lift up the whole pro-life movement like maybe it’s never been lifted up before. The pro-life movement is very much a 50-50, it’s a very 50-50 issue, actually it’s gained a point or two over the years," Trump said. "I think this will very much lift up the issue because people have never thought of it in those terms," he added. This entry was posted in Issues, Politics and tagged Abortion, Donald Trump, Ralph Northam, Virginia. Bookmark the permalink.